As you may know Thoroughbred Breeders Australia successfully lobbied the Australian Government to introduce a matched thoroughbred research and development levy. This levy started in breeding season 2017 and in its first full year raised about $400,000, which is then matched dollar for dollar by the Australian Government. In addition, Thoroughbred Breeders Australia and Racing Australia have made voluntary contributions to the pool of funding, which have also been matched by government. The levy allows us to commission research that safeguards the long-term future of our industry. We are able to invest in projects that make a significant difference in areas such as the prevention and management of exotic and indigenous diseases; raising the conception rates of mares and stallions; improving foal health; as well as research into welfare, injury rates and industry modelling. When the Levy began TBA ran an extensive consultation process to ask breeders what areas should be prioritised for research. As a result of that process a number of projects have been started, but we are now looking for new areas of research. We want to hear from you, so please read the section below and send us your suggestions. How the levy works? The levy is set at a rate of $10 per mare covered per season, paid by the stallion owner and $10 per mare returned per season, paid by the broodmare owner. These payments are made through the Australian Stud Book. How much is raised? In its first full year the levy raised in the region of $400,000 from breeders, though this will fluctuate with the numbers of mares being covered. Who oversees the money? Racing Australia – owner of the Australian Stud Book – collect the money from breeders before passing it on the Agrifutures. Who are Agrifutures and what do they do? Agrifutures is the new name for the Rural Industries Research and Development Corporation (RIRDC). Because the federal government is making a significant investment in the Thoroughbred Levy scheme, they require Agrifutures to oversee how the money is spent. Their role is to work with the breeding industry, develop a 5 year plan for R&D, and then commission projects and ensure they are delivered on time and to the standards the breeding industry expects and requires. What involvement do breeders have? No project will ever be funded from breeders’ money without the approval of breeders. An expert panel has been set up by Agrifutures, upon the recommendation of TBA, and their role is to suggest projects, oversee the commission of studies, and assess proposals that are put forward by researchers seeking funding. TBA also has a regular monthly meeting with Agrifutures to be updated on all projects. Tas Rielley (owner/operator of Basinghall Broodmare Farm at Nagambie). How can I suggest projects? Non-invasive ventilatory support for foals: Breathing difficulties and lung disease are common in foals and may be transient immediately after birth, or may be related to prematurity, infectious disease or other conditions. This project will continue work by the research team on non-invasive support of respiration in neonatal foals using commercially-available, positive airway pressure (PAP) devices used for at home care of respiratory conditions in people. This approach promises to increase our ability to support foals with breathing difficulties more effectively than by administration of oxygen alone, but without invasive ventilation procedures that are technically demanding and usually cost-prohibitive in equine patients. Measure the economic impact of the thoroughbred breeding industry: This project, which is almost completed, estimates the contribution of the breeding industry to Australia’s Gross Domestic Product and includes a breakdown of economic contributions across all key aspects of the industry. Both the direct and indirect contributions from thoroughbred breeding are captured. This information is important for explaining the significance of our industry to a range of stakeholders and decision makers. Improving the detection of parasitic infections and control strategies in horses: Currently, there is an incomplete understanding of the gastrointestinal parasites affecting the health, performance and welfare of thoroughbred horses in Australia. Although documented for some important parasitic nematode species, the true extent of resistance in parasites of horses to the commonly used anthelmintics in this country is unknown. This project aims to determine the epidemiology of intestinal parasites, assess practices to control parasites, understand the resistance to antiparasitic drugs and develop rapid diagnostic tool for infections in horses. Improved bacterial identification and antimicrobial testing: This project will generate epidemiological data on the bacterial species associated with different infectious diseases in horses in south eastern Australia, and the antimicrobial drugs to which these isolates are susceptible. This information is of vital importance to equine veterinarians as treatment is often, of necessity, initiated prior to receipt of laboratory results from individual patients. In such cases, the best available information on which to base drug selection is data from similar patients in the same location. This data is simply not available in Australia. Collation of such data over time allows recognition of changes in antimicrobial susceptibility, which is critical for recognition of the emergence of antibiotic resistance in bacteria. A second outcome will be comparison of more advanced laboratory techniques available for the identification and testing of bacterial isolates. The uterine microbiome – key to equine fertility? : This project aims an improved understanding of the role of the bacterial microflora of the equine reproductive tract on equine fertility. Following on from this, novel diagnostic and treatment methods for equine infertility will be developed. In addition, the research aims to formulate easy-to-use on-farm protocols for management and treatment that could significantly improve fertility outcomes. These might include alterations to how stallions are treated between breedings or how mares are prepared for breeding. The ultimate outcome of this research will be improved fertility rates for broodmares, as the causes of infertility in some older, chronically infertile mares are identified and effective treatment regimens are developed. Understanding heat stress and stallion fertility: Systemic heat stress in mammals is detrimental to sperm production and male fertility. This phenomenon has not been adequately examined in the horse, or in a field setting relevant to the Australian Thoroughbred industry. Specifically, we do not know how the climatic conditions experienced by stallions in the major Thoroughbred breeding hubs of Australia affect their fertility. Some 43 stallions will be examined as part of the study, with the aim of developing measures to successfully alleviate the effects of heat on fertility. Understanding the epidemiology of Chlamydia psittaci infections in mares: Equine reproductive loss due to infectious agents impacts significantly on Australian Thoroughbred breeders. While a range of bacterial agents are a recognized cause of equine abortion, Chlamydia psittaci has emerged as a cause of reproductive loss as well as zoonotic disease of veterinarians and stud workers. Recent work has confirmed that prevalence rates of C. psittaci-infected equine pregnancy losses were higher than were originally considered, suggesting that this problem may be widespread and not just a recent phenomenon. While molecular methods have pointed to contact with birds as a key part of this issue little else is known about equine chlamydiosis, challenging any efforts to reduce the risk to animal and human health. This project aims to reduce pregnancy losses in Australia’s thoroughbred industry by revealing basic information on the epidemiology of this disease, focussing on two key aspects of this disease, the C. psittaci-infected mare and the potential avian reservoirs of C. psittaci infection. Rapid diagnosis of infectious agents of reproductive loss: Equine reproductive loss due to infectious agents impacts significantly on Australian Thoroughbred breeders. A range of bacterial agents are involved. Some of these also pose a significant occupational health risk to workers in this industry. Accurate detection of the infectious agents is important for the management of affected mares. While nucleic acid testing is considered the ‘gold-standard’, testing is normally only performed by well-equipped veterinary diagnostic laboratories with molecular capabilities. This restriction means significant delays before diagnostic results are available. 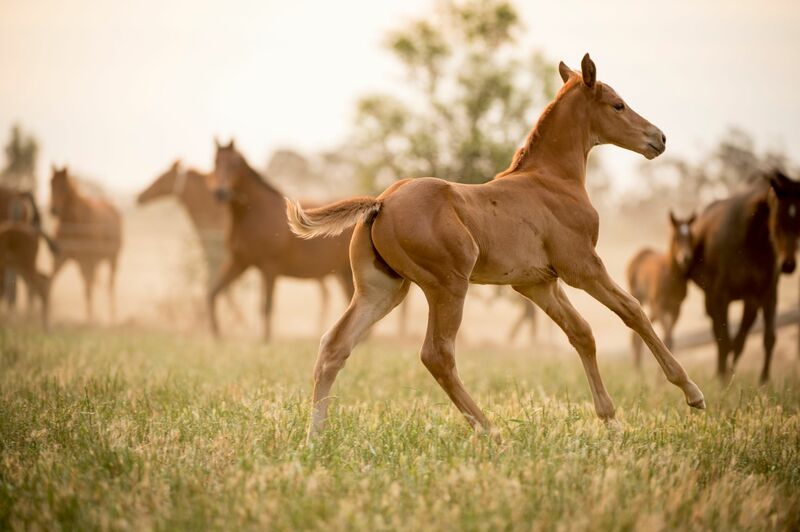 This project aims to develop and evaluate rapid nucleic acid tests for two important causes of equine reproductive loss in Australia, Equine Herpes Virus-1 (EHV-1), a recognized cause of equine abortion, and Chlamydia psittaci, an emerging cause of reproductive loss as well as zoonotic disease of stud workers and veterinarians.